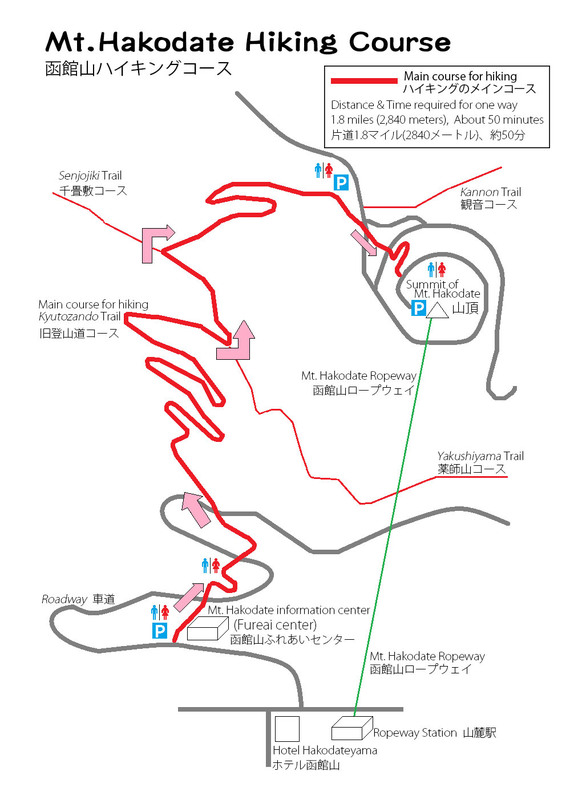 It takes 3 minutes to get to the summit from the base station. Most people use this access. Before and soon after sunset, the cable car can be crowded. An operation can be canceled in case wind is stronger than a set speed. 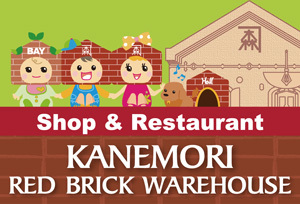 In the autumn season, the service is suspended for maintenance for about 2 weeks. The fare is 1,280 yen for the round-trip and 780 yen for one way. 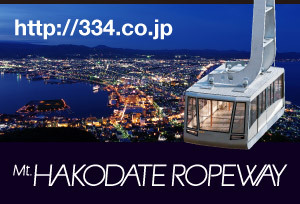 The bus starts at JR Hakodate Station and goes up Mt. 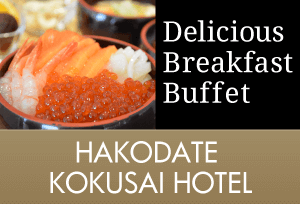 Hakodate via the Bay area. It is a bus on a regular route. You don’t have to change buses. It takes about 30 minutes when there is no traffic jam. The road is busy during the tourist season. No operations are available during the winter because the road is closed for safety reasons. The one way fare is 400 yen. 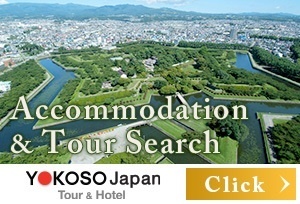 The bus leaves from and returns to JR Hakodate Station, certain hotels near the station, and certain hotels in Yunokawa Hot Spring. You can enjoy Mt. 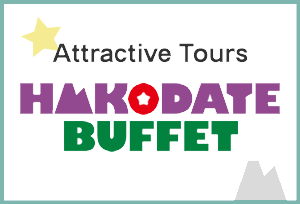 Hakodate sightseeing conveniently. Depending on the seasons, there are two methods of transportation; bus and cable car. The bus can take you to the foot of the mountain or to the summit. From the foot of the mountain, a cable car also carries passengers to the summit and back to the foot of the mountain. (There is a case where you could use the bus and the cable car.) 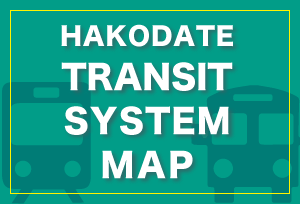 The bus departing from Hakodate Station takes about 1hour 30 minutes round trip, and the fare varies from 1,000 yen to 1,600 yen. The bus departing from Yunokawa takes about 2 hours 15 minutes round trip, and the fare varies from 1,400 yen to 2,000 yen. Taking a taxi is recommended for a group of 3 or 4 people. 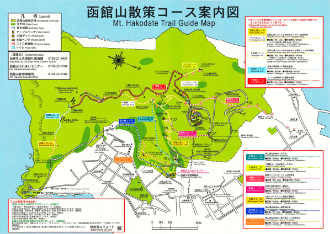 Typically, you ride a taxi and go to the summit, have the taxi wait for 30 minutes while you see the view, and then take the same taxi to go down. This access is not available during the winter because the road is closed. 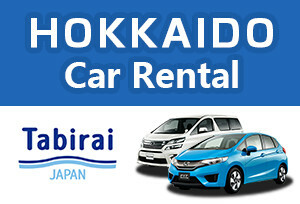 The fare varies from 8,000 yen to 16,000 yen per taxi to go to and from Hakodate Station (depending how busy the road is). You can go around at your own pace by rental car. But the rental car is not permitted during the time the road is busy (from 5 pm to 10 pm between April and September, from 4 pm to 9 pm in October and November). The road becomes congested right after the end of the restriction. This access is unavailable because the road is closed for safety in winter. 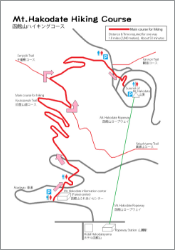 There are well-maintained paths from the base to the summit of the mountain. It takes about one hour from the Mt. Hakodate Information Center (6-12, Aoyagi-cho) (by the Tsutsujiyama route). Wear sneakers in the summer and ordinary snow boots in the winter. It is recommended taking a long-sleeved jacket against bugs and the cold.